A new collection from Sorella Jewelry Studio is providing a more personalized touch unlike any other jewelry collection before. The new collection with have personalized cuff links for men to add an elegant and polish touch to their outfit. If you are looking for a the perfect jewelry for men, you should consider cuff links as an option. Cuff links have been worn by men and are becoming more popular. In both professional and personal situations, men have been wearing cuff links. All the cuff links which will be made available are in sterling silver, 14k yellow gold and 10k white gold. You can find out more about the collection in a recent article including photos of the new collection. The new TomTom collection of jewlery, puts a unique and very cool spin on the idea of space and outer world experiences. If you are a fan of supernatural, comics and futuristic designs, you might love the collection from this Los Angeles based jewelry brand. 'Tron: Legacy', which is the titled of the new collection will be released just in time for the mad rush of Christmas shopping this year on 17th December. This collection, which was in collaboration with Disney Consumer Products, will rock your world. 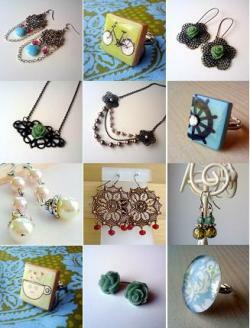 The collection has a full range of wearable necklaces, rings and bracelets. TomTom has also done a very slick and cool uni sexed style cuffs that are also becoming more popular. For me Swarovski is the ultimate in fun bling. Some of their jewelry is truly beautiful, but other times it's just a pale imitation of the real thing. Where they really excel is when their pieces are downright whimsical. They have a little something for every mood. So I wasn't entirely surprised when they came out with an Alice in Wonderland line. They already had a deal with Disney, but their cleverness goes beyond what you might expect. Beyond the Pinocchio and Seven Dwarfs crystal figurines, they have lovely jewelry designs that are inspired by the films, rather than simply aping them. For example, a lovely Sparrow Pendant is inspired by the pendant Alice wears in Alice in Wonderland. At $115 it won't break the bank and it's just plain classy. 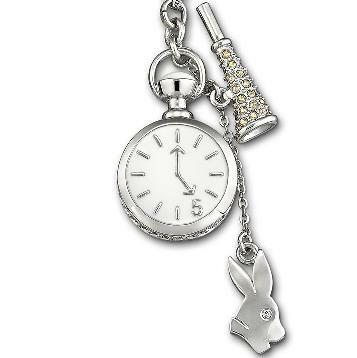 Or the Tea Party White Rabbit Pendant, which is as clever as it is cute. A limited edition only available online, it's just plain fun. And for those days when you're really ticked at your boss, but have to keep your mouth shut, the Red Queen Cards earrings might brighten your outfit and lighten your mood. You can always imagine yourself saying, "Off with his head!" Photo above is from Swarovski.com. An entrepreneur with a creative heart and strategic mind for business, Leslie Greene was inspired to design her own line to satisfy every woman's desire for fine jewelry that flaunts chic style, luxurious quality and a timeless, classic appeal. Designing jewelry for over 16 years, her talent for combining treasured classics with modern trends has truly brought her to the forefront of the fine jewelry industry. One of today's preeminent designers, Leslie Greene uses genuine diamonds and gemstones on a canvas of sterling silver to convey vintage designs and patterns. Note the high level of detail in each of her light and airy designs. This sterling silver enhancer is intricately detailed with an openwork scroll design. Radiating from the center is a faceted, cushion-shaped gemstone that is prong set amid a border of round, bead-set diamonds. Coin edge texturing furthers the look. Milgrain work, beading, and round, bead-set diamonds give the circle charm on these hoops their unending sparkle. The openwork charm dangles from a round hoop, which has a raised, textured center and a milgrain border. 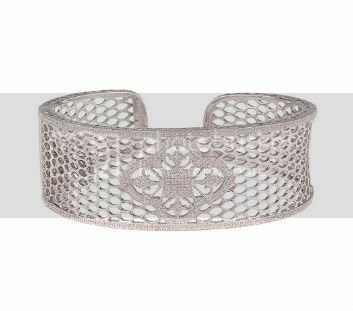 The delicate openwork mesh design of this vintage-inspired sterling silver cuff has all the ladylike appeal of antique lace. At the design center, round, bead-set diamonds sparkle like winter's frost. A true designer, Leslie Greene's collections are the culmination of her creative interests, including fashion, home decor, antiquing, and the fine arts. As an avid world traveler, rare antiques, vintage wallpapers, and historical architecture lend inspiration to new designs. The daughter of a textile designer, Leslie is also very much influenced by fashion and fabrics of the past and present. 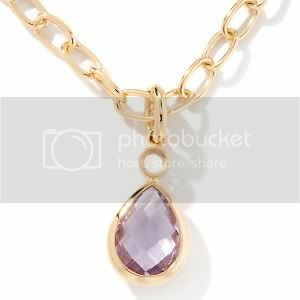 Renata Studio Jewelry is created using Technibond – a trademarked plating process for jewelry sold exclusively by HSN and hsn.com. 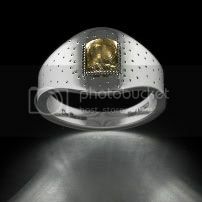 Technibond jewelry is crafted from .925 sterling silver with a 40-mils-thick outside layer of 14K yellow gold. Technibond was created for HSN in November 1990 as a way to offer the look and feel of Gold at a lower price. 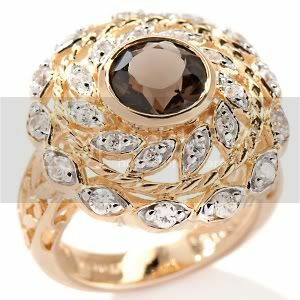 Fashioned from 14K yellow Technibond, the beguiling ring showcases a round silhouette with a bezel-set, round faceted smoky quartz in the center. A 3-row frame alternates rhodium-plated rows of marquise-shaped stations with a single rope-textured row. The vintage-like stations sparkle with prong-set, round clear CZ accents. Glistening with a feminine elegance, a bezel-set, pear-shaped pink amethyst drop with a checkerboard-cut silhouette falls gracefully at the neckline. 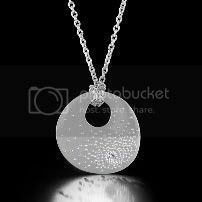 A bezel-set, round clear CZ at the top of the drop infuses added sparkle into the glamorous piece. 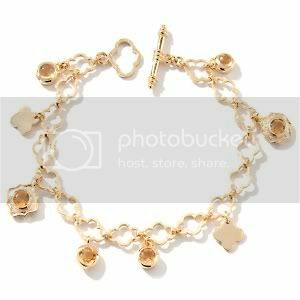 Influenced by Indian design, this 14K yellow Technibond charm bracelet showcases eight charms dangling from openwork geometric links. Two charms feature bezel-set, round citrine cabochons, two charms tout solid stained glass-inspired silhouettes, two charms flaunt bezel-set, round faceted citrines in antique-like frames, one charm presents a bezel-set, round faceted citrine and the final charm completes the piece with a faceted citrine beneath a geometric overlay. Inspired by the exotic influences found in Indian jewelry, Renata Studio Jewelry offers gemstone jewelry in rich exquisite colors. Each piece has a lifetime manufacturer's warranty against damage to the complete piece, including plating and stones. Fashioned from 14K yellow Technibond, this line of jewelry offers fresh silhouettes and scrumptious stones. De Beers is diamonds. Whether it be in the creation of the De Beers Millennium Star or your very own diamond engagement ring you have the reassurance of knowing that the same painstaking craftsmanship, love, and attention to detail is put into each and every piece. Cut for beauty and handcrafted by artisans, De Beers stunning diamond jewelry designs harness the timeless magic, sparkle and joy that only diamonds can bring. 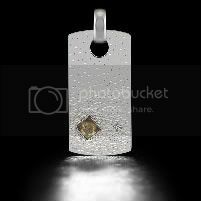 Babylon Steel Tag from the De Beers Talisman collection. 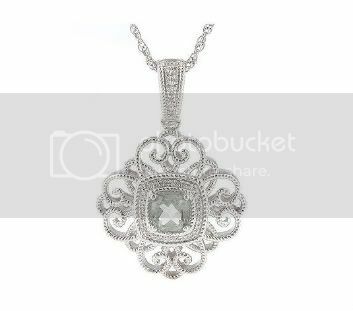 Stainless steel pendant set with one polished round brilliant and one rough diamond. Hallmark setting. Retail price does not include the chain. Can be worn on a cotton cord sold separately. Pendant measures 14mm x 28mm (.55 x 1.10 inches). Total carat weight 0.67. Diamond Babylon Ring from the De Beers Talisman collection. 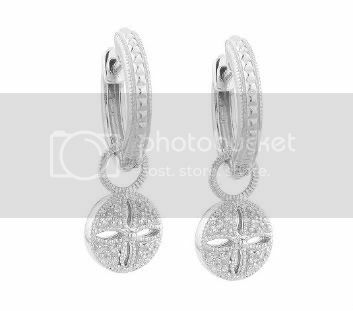 Stainless steel set with a rough, unpolished diamond. Hallmark setting. The ring is approximately 10.9mm (.43 inches) diameter Total carat weight 0.63. Lucky Diamond Pendant from the De Beers Talisman collection. 18K white gold set with a white round brilliant diamond. Hallmark setting. Includes a removable 42cm (16.5 inches) trace chain. Pendant measures 15mm (.59 inches). Total carat weight 0.017. In 2008, De Beers opened five new stores this year in the United States – Dallas, San Francisco, Costa Mesa, Naples, and Bal Harbour. In 2007, they added stores in Las Vegas, Houston, and Washington, DC, and a new website with e-commerce capability was launched, and Stephen Webster designed the first men's collection for De Beers. The Talisman 8 Watch collection was also introduced. A Ring Thing is a jewelry design and goldsmithing company located in California. They have been in business since 1975, creating and making all kinds of unique jewelry in 14k and 18k white and yellow gold, and platinum. They focus on making high quality rings set with well-cut gemstones and diamonds. Their goal is to make beautiful exciting rings more affordable. This is a striking contemporary ring, hard edged, accented with brilliant diamonds. These bands are flat on top with a unique bright random cut finish. The side edges are highly polished. One band has three flush set diamond. Most rings are available in a variety of metals, including 18K, palladium, and platinum. Each ring has a satin yellow gold band bordered by a highly polished white gold edge. A diamond is flush set in the yellow gold band near a unique opening in the white gold. Both rings are very slightly domed on top. Graceful folds of 18K white and yellow gold are completely covered with a blanket of brilliant diamonds. Diamond: .87 ctw 56 round accents. Finish: High Polish. 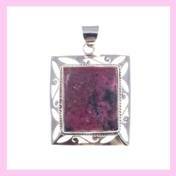 This wonderful pink color comes from the gem deposits of Ceylon. Tourmaline means many colored stone. Setting technique: 4 prong. Each band is softly domed on top with a very unique bright random cut finish. The outer edge is high polished. A single flush set diamond highlights one of the rings. A unique band in two color 18K gold with brilliant blue diamonds. Diamond: .23 ctw 18 round blue diamond accents. A unique partial eternity band in 14K yellow gold with brilliant yellow and white diamonds. beautiful lemon quartz center gemstone is set off by two sweeping arcs of khaki topaz. Always searching for that perfect piece of jewelry, the Honeybee Collection is the essential collection of affordable fine jewelry. The look of the collection is sophisticated and timeless and never goes out of style. Each piece is chosen because of its versatility to wear day or night. Distinctly feminine, this collection is created to match the modern woman's approach to life. 14k yellow gold round filigree diamond pendant on 16" necklace. The filigree detail gives this diamond necklace an estate look in a contemporary design. Wear alone or layer it with other gold necklaces. 9 diamonds totaling .15 carat weight. 18k yellow gold round disc dangle earring with 1 bezel set diamond (carat total weight is .04). 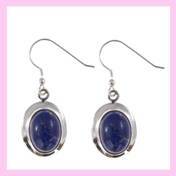 Earring is 3/4" in diameter. This contemporary gold earring is the perfect casual classic look to be worn day or night. 18k yellow gold small hammered circle with diamond (.14ctw) pave circle necklace on 16" chain. This necklace is modern and unique. Layer it with other necklaces or wear alone. Whether at home with children, on the road with a bustling career or on the party circuit, the women who wear the Honeybee Jewelry pieces find them practical and comfortable as well as chic. The effortlessly classic style of each piece is designed to be worn alone or to be added to any piece of jewelry already in every woman's jewelry box.